Most of the buses in Pagudpud usually leave town in 15-minute intervals. So you won't have a hard time getting a ride to Laoag, if ever you're heading there. Anyway, Kuya Raphie picked us up at Cathy's Homestay and dropped us off at the terminal. He waited until our bus left, which was at 9:50 in the morning. The trip back to Laoag from Pagudpud almost took 2 hours since the bus did a lot of stop-overs (picked up passengers along the way). So we were only able to reach Laoag at 11:40 am. It also took us 5 minutes to get to our accommodation via tricycle. And when we finally settled at Balay Da Blas, we left immediately for Saramsam Ylocano Restaurant to get some lunch. The real adventure actually started when we ate the most outrageous yet sumptuous mix of ingredients in a pizza, which ended the day with high spirits right after ending our city tour around the 'Sunshine City of the Philippines'. The City Tour in Laoag usually takes about 3-4 hours (depending on how long you intend to stay in each tourist spot), so plot your time accordingly. The best way to maximize your time would be to start from the farthest point of the tour. Also, we requested for this specific tour c/o Balay Da Blas for a fixed rate of Php700. When our tricycle driver/tour guide, Kuya Mario picked us up at 2:30 pm, we immediately started our road trip towards the Malacanang of the North. We started our tour by going around the different sections of the mansion, and took photos of each room for a good 10 minutes (total!). Here, we were able to see firsthand, the prized possessions of the Marcos' -- from former President Marcos' spacious bathrooms to Imelda Marcos' exquisite room furniture and display. Next in line was a trip to Paoay Lake. We actually had a great view of the lake from the Malacanang of the North. But seeing it up close was -- well, just ordinary. We stayed here for only 2 minutes before deciding to continue towards Batac -- the province where Ferdinand Marcos' mausoleum was located. We were dropped off at the Marcos Museum after a good 20-minute travel from Paoay Lake. At the Ferdinand E. Marcos Presidential Center, the former president's memorabilia were displayed on a wooden hallway -- each highlighted with all of his achievements throughout the years. When we finished our rounds, we went down to visit his mausoleum. Thankfully we were still able to see his remains since visitors were only allowed to enter the room until 4 pm. Setting foot inside the chilled room felt eerie at some point. But I actually felt more intrigued than scared upon seeing Marcos' preserved body. At my standpoint, he looked like he didn't die at his 70's. 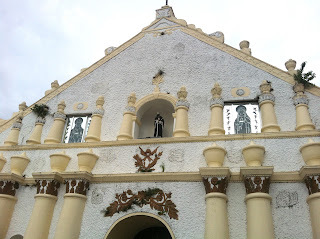 Paoay Church is the Roman Catholic parish church of the municipality of Paoay, Ilocos Norte in the Philippines. Completed in 1710, the church is famous for its distinct architecture highlighted by the enormous buttresses on the sides and back of the building. In 1993, the church was designated as a UNESCO World Heritage Site as one best examples of the Baroque Churches of the Philippines. After Paoay Church, Kuya Mario brought us to the Paoay Sand Dunes. We would've wanted to check out the sand dunes and do all the activities but decided not to anymore due to budget constraints. So we went to Fort Ilocandia afterwards. I guess we were also tired from all the walking, riding, picture-taking and sightseeing that's why we only took a picture of the Fort Ilocandia signage as our background. We did this before heading back to the city. It took us about 20 minutes coming from Fort Ilocandia to Laoag city proper. And from the welcome arc, you'll be able to see this tiny monument between the main roads -- this is the Tobacco Monopoly Monument. Since I was also running on empty (my camera that is), we hurried next to the Sinking Bell Tower, which was just across the street. We really couldn't take decent photos here since there were too many vehicles passing by. But when Rubel did get a good shot of me after 5 minutes of smiling awkwardly, we crossed the street to St. William's Cathedral. 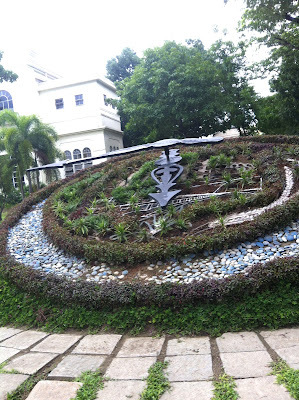 We also whispered a short prayer at the cathedral, before heading out to our last two sites: the 'famous' Laoag wall clock and Provincial Capitol. We ended our whole city tour at 6:15 pm. Don’t leave Batac without trying their famous special orange Empanada, particularly poured with sukang Iloko (get your empanada at Lanie's Batac Empanada). Always order the one that’s newly cooked to appreciate each bite. You should also try the Pinakbet Pizza and Longganisa Pizza from Saramsam Ylocano Restaurant & Bar. You'll be surprised with the local flavors, I promise you! 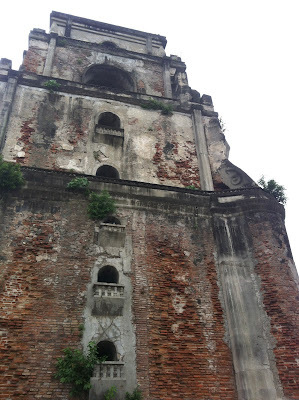 When you're done viewing the Paoay church, make sure to drop-by the Herencia Cafe area. At the back of this restaurant, you'll be able to see a few stalls that are selling packed Ilocos treats (you can buy garlic and cheese flavored chichacorn here for Php100/3 packs). Get your street-smart tips here! 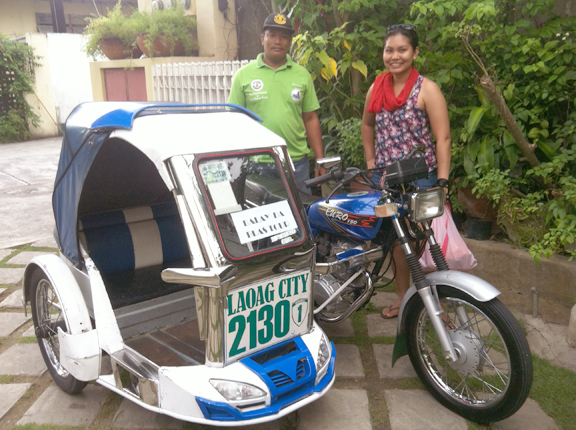 Always remember that the city tours in Laoag via tricycle are priced at PHP 700. So remember not to pay more than that. Also, regular tricycle rides only cost PHP 11/person. And if you’re riding the tricycle back to the airport, only add PHP 2 for every succeeding kilometer. The Laoag airport also offers free shuttle rides going to downtown Laoag. wow Ilocos is such a captivating place to visit. It reminds me of my travel in Laguna where the place is also rich in cultural, religious and historical sites plus you can enjoy the natural wonders and local delicacies there. I will visit this place. I am so glad u had a great time in Ilocos, if i had known u earlier, might as well volunteer myself to be ur driver and guide:)) not necessarily driver coz i cant drive yet hahaha. Hi Sherene! Thanks for the sweet thought. :) Are you currently located in Ilocos? Gusto kong puntahan ang Paoay Church. Bawal po Bang pumasok sa loob ng simbahan? wow! this is great because we'll be visiting Laoag on the 19th! Cool! 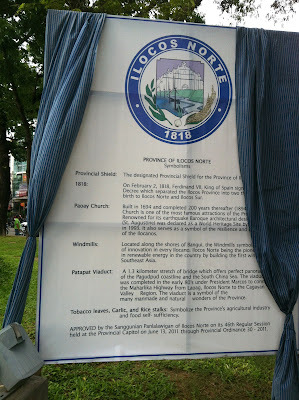 My folks are from Ilocos Sur and we regularly go there in the summer. Sometimes we venture out north to Laoag and beyond (usually when we have visitors). But I've yet to try that pinakbet and longganiza pizza. Will do when I have the chance. WOW! Great place. Love to see the MALACANANG of the NORTH. And also to eat their famous orange EMPANADA. 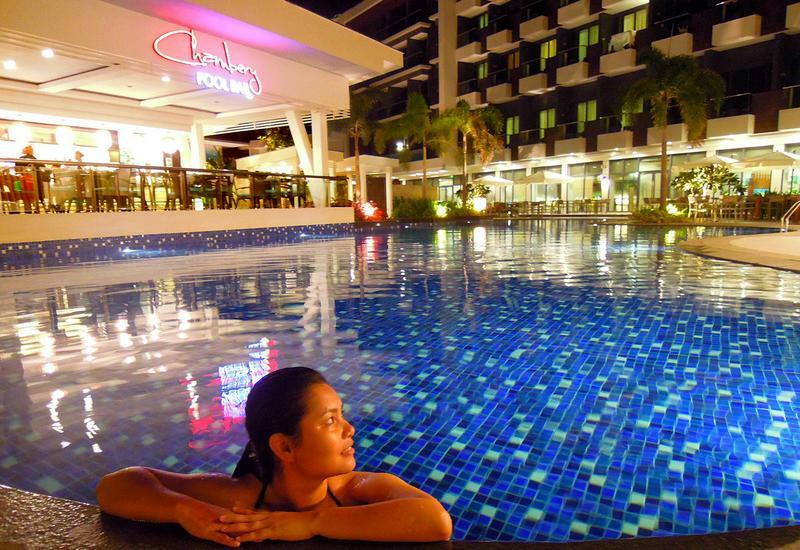 Nice photos and sure you did have a fun Laoag experience. Hay naku, parang gusto ko ng Fiesta sa Cabugao.. at least makakarating na naman dyan sa Laoag. did my comment get through? Aside from my penchant in Historical Churches, and Places, the reason I want to visit Ilocos particularly in Laoag and Batac is Marcos. I wanted to see the remains of Philippines greatest president. Bibisita talaga kami next year and we'll tag Edmar para meron kaming local na tour guide. hehehe. My friend and I are planning on taking a trip to Vigan early next year. Hope you don't mind that I downloaded your expense sheet. It's really going to help me and my friend to plan our budget for our trip. Wow! Ang ganda ng shots, sis! Ok sa budget and planning! Sulit na sulit ang trip! I am planning to North Luzon before December ends- first on my list is Ilocos. 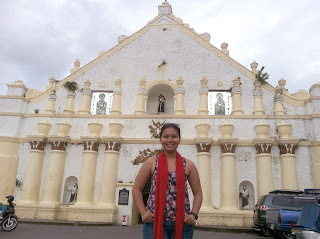 Empanada, Marcos Shrine, Paoay Church and bagnet wew!will bookmark this post, thanks Mai! Very Nice Article. Thank You. Weee! Very helpful 'to! I'll be visiting this place next month! Thanks! Think I just found a very good destination for my trips next month. Great place. Super clean and that view of Paoay Lake from the Malacanang of the North is really nice. Thanks for the info, Mai! Very helpful! wow 14k+ for 2..5D 4N. you live with your rules.. budgetbyahera..i salute you :) galing..
Maraming Salamat! :) Happy New Year!